Successfully Added High Capacity Solar Charger and Battery (20,000mAh) to your Shopping Cart. High Capacity Solar Charger and Battery - the perfect green tech gadget for the modern traveler. With a powerful 20,000 mAH battery and 29 unique adapter tips, this solar charger will power and charge just about any portable electronic device. With its powerful 20,000 mAh battery, this Solar Charger and Battery will provide many more hours of usage for your electronic devices and will seem like an endless power supply thanks to the constant charging by the solar panels. Also included is a handy button to show the amount of power left in the battery and when it's low, just use the car charger, wall plug, or even leave it out in the sun to quickly recharge. With 29 unique adapter tips, this Solar Charger and Battery will work with almost any portable electronic device. No more messy cables, no more multiple power adapters, this handy tech gadget will save users both money and frustration. Available in our warehouse now, order today and we'll express ship it out tomorrow. Brought to you by the leader in wholesale electronics - Chinavasion. Less than 3 hours when using the wall AC adapter, and around 8-10 hours when using solar energy and under direct sunlight. 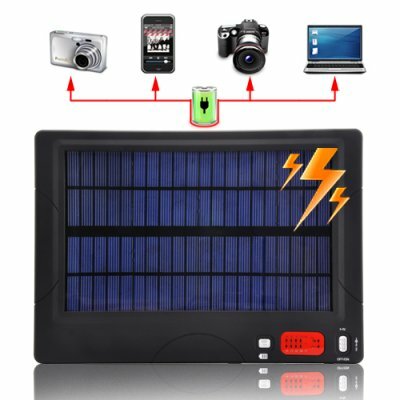 It depends on the power consumption, but some have stated that their laptops lasted for a whole day thanks to this Solar Charger and Battery. The shipping was very fast. This was very impressive. i have just have received mine after 3 days of ordering, really thumbs up for the logistics of these people, very good!! I have tested so far with my samsung i8000 smartphone and my laptop with a broken battery (and yes both worked like a charm). I have no doubts that other stuff will work also, so i will test more and more stuffs on this. Thanks for the cool gadget! on 2010-08-27 17:01:56 Great product! I took this solar charger to Madagaskar, where i had no power source whatsoever. Every day i would charge it, and it had no problem charging it from 25-50% to 100% in one morning. Every evening i charged about 3 camera batteries and 2 - 3 MP3-players, doing so i supplied power to our whole traveling-group with this one panel, while i only used 50% of the battery every day. Product delivered with speed. Keep it up!